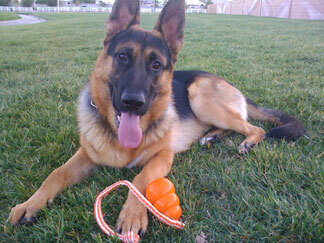 Caine is a 14 month purebred GSD. He has black and red coloring and his bloodlines stem from West Germany. Caine has a loud bark, but is not aggressive towards any human or animal, and just likes to have a good time. His favorite pastimes are running after his Kong ball, practicing his obedience, and cuddling with dad whenever he can. He lives in Las Vegas, NV, but isn't old enough to gamble :-).